This is an 8″x10″ canvas board I picked up at a thrift store earlier this summer. I’m guessing it might be 15-20 years old because I got eight of them in various sizes that were still in their original packaging and all for $2! What’s a girl to do with all those blank boards but start smooshing and spreading and getting her hands messy! I started out with summer colors–bright orange and turquoise blue but as you can see that didn’t last long. I ended up with “mermaid colors”. 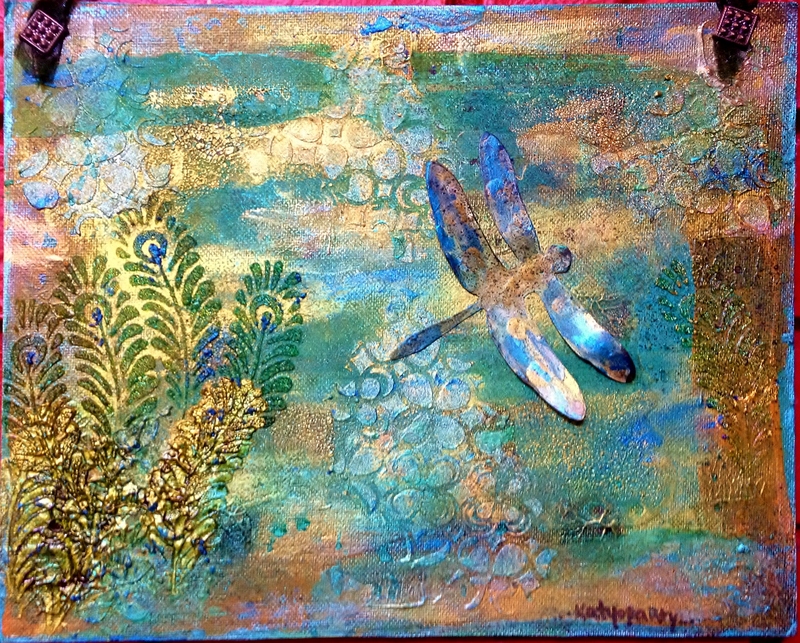 The dragonfly began as a Tattered Angels piece that I misted and then built up with acrylic paint, Inkagold, and Shiva Paintstiks. At some point it was outlined with a Pitt pen. The canvas itself is layered over and over again. I started out experimenting with Kroma Krackle and I am in love with this stuff! You can see the deep cracks in many areas. I put it down on one layer but then went back with it several times after adding more layers with different mediums. My “swaying” peacock feathers were stencilled with glass bead gel over several layers of paint, mist, and Inkagold paste. I love the variations of color that you can see through the bead gel. I continued to layer with 3d stencil paint and then toned down the gold with Smooch sprays, Lindy’s Stamp Gang sprays, and Shiva Paintstiks. I also used Golden Crackle Paste to stencil some flowers randomly in one of the first layers I put in the background. I used some Vintag metal brads to anchor a simple organza ribbon for hanging. I am happy with the way this canvas evolved and turned out. Thanks for visiting and come back soon because you never know what can happen when you…. If you're not a WordPress user you can still follow me by email! How Many Really Cool People Have Been Here? Patsy Porco's Blog: Free and Worth It! Humor, laughter, husbands, wives, children, family, friends, dogs, work, recreation, and everyday life. Connecting to the world with crafts and art.